In my 4 years as an avid board gamer I’ve been all kind of heroes. I’ve protected medieval towns from invaders, I’ve cured humanity from plaguing diseases, I’ve prevented the world from destruction by the Ancient Ones… But never before had I saved a bunch of polar bears from drowning. Rescue Polar Bears: Data & Temperature published by Taiwan Boardgame Design lets players be heroic scientists in the fight against global warming. Read on to find out if this game left me hot or cold. What is Rescue Polar Bears: Data & Temperature like? Rescue Polar Bears is a cooperative game for up to 4 players. The use of fossil fuels has caused the arctic to melt and the polar bears are now trapped on drift ice in the open ocean. Every player controls a rescue boat to evacuate the polar bears and collect environmental data. This data will proof the disastrous effects of global warming and might make governments rethink their energy policy. 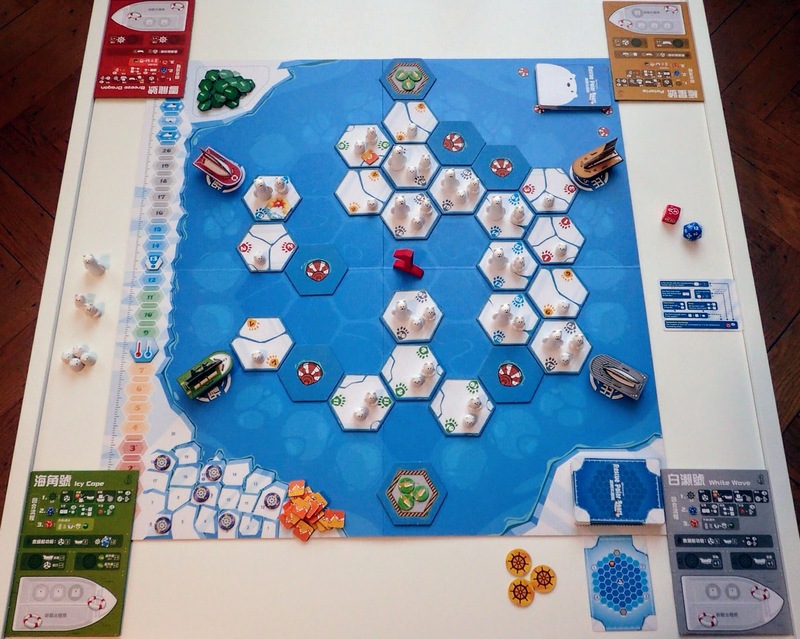 The game board consists of an ice floe crammed with polar bears, 2 science bases, a Temperature Track and a Data Track. Throughout the game Data Tokens will randomly appear in the ice floe and the team wins when all 20 tokens get collected. While working towards this goal, the temperature may not rise above 20 degrees Celsius and no polar bear may drown. But despite their desperate life conditions the polar bears keep reproducing and overpopulation causes them to fall off the drift ice, into open water. The Polar bears are dispersed over 20 numbered drift ice tiles. For each tile there is a corresponding Alert Token. The Temperature Track will always have a random drawn Alert Token on the spot with the same number. At the start of the game the Temperature Token is set on 8°C. For every spot on the board (ice and ocean) there is a corresponding Data Token. 1 token is drawn at random and placed on the matching location. -Sail: Move a number of hexes according to the speed limit of the rescue boat. -Load: Put one polar bear from an adjacent hex on the rescue boat. -Unload: Put all polar bears from the rescue boat on an adjacent base tile. Data Tokens in the water are picked up by ending the “sail” action on that spot. To pick up data from an ice tile the player needs to position his/her boat adjacent and “load”. Then the next Data Token will pop up at a new location. An ice tile can hold a maximum of 3 polar bears. To prevent overpopulation players need to re-allocate the polar bears thoughtfully or evacuate them to a science base by using the actions “sail”, “load” and “unload”. After each player’s action phase the roll of a D20 die determines on which tile polar bears will reproduce. If there are both a male and female polar bear on the depicted tile, 2 polar bear cubs must be added. By consequence the capacity of the tile will be surpassed and excess polar bears need to flee to adjacent tiles. If there is no polar bear-couple but one or more bear cubs ,they grow up to adults. If neither of these things happen, a custom D6 is rolled which will cause the Temperature to rise by 2, 3, 4 or 5 degrees. Whenever the Temperature Token surpasses the Alert Token on the Temperature Track, the ice tile related to the Alert Token melts and all polar bears on it flee to neighboring icebergs. A new Alert Token is drawn and placed on the Temperature Track. When polar bears are unable to flee they take a plunge into the ocean. In that case an emergency rescue helicopter is needed to save the polar bears from certain drowning. But the team can only perform 6 emergency rescues throughout the game. It’s very hard for the team to keep head above water under these harsh conditions. Luckily collecting data makes players gradually upgrade their rescue boats and life Support Cards can be acquired that provide instant benefits. Every player’s rescue boat has variable powers. A boat might be faster, making it apt for collecting data, others have a bigger hold or help better managing the Temperature Track. Thus each player has a distinct role in the mission. Kudos to the designers for making a game about global warming. The cuteness of the polar bears make players immediately feel accountable for their wellbeing. Rescue Polar Bears: Data & Temperature doesn’t offer innovative gameplay, but theme and design make the game still feel fresh. Fans of the co-op genre will have a level of familiarity with the game mechanics, which eases the learning curve considerably. The random set-up adds to the game’s replayability. The randomness of the dice-rolls, tokens and deck can highly influence the game’s outcome. The designers risked themselves on thin ice by combining “toy-like” components with an adult game set. At first glance the game is often frowned upon by “serious” gamers. However, I feel the designers made this one float. Rescue Polar Bears: Data & Temperature is an enjoyable and challenging game. The game doesn’t come with the clearest rulebook. Some jumping back and forth between pages is necessary as many mechanisms and effects are correlated. However the game flows smoothly after 2-3 rounds. As with many cooperative games it’s very hard to reach the win condition though. Not being able to save those cute little polar bears is heartbreaking. Let’s hope in real life it’s not yet too late!